NADXA has had some very distinguished members who have moved on to that QTH where everyplace is line-of-sight. We fondly remember these former members whose keys turned silent in recent years. ZK1TB at one of his favorite QTHs, Rarotonga, in 1986. Lew's experiences as an aviator in WWII led him to enjoy many return visits to exotic locales such as Rarotonga, Fiji, and Russia later in life. He was a professional radio technician who loved designing and building top-quality homebrew gear. In honor of Lew's accomplishments and dedication to DXing, NADXA adopted his W7TB call sign for the club station. 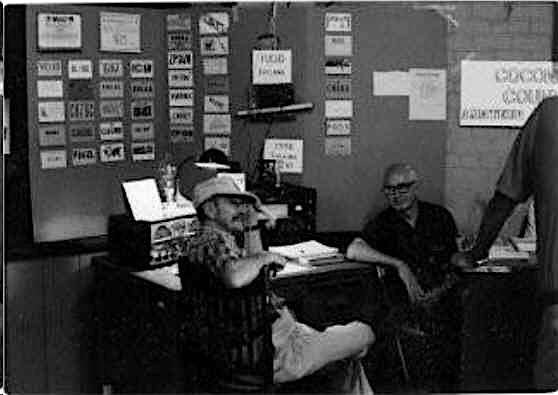 Before joining the ranks of silent keys, Lew had worked well over 300 DXCC entities. 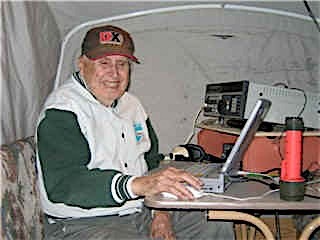 Bill spent many hours chasing DX on SSB, earning quite an impressive total before he passed away just before Field Day 2000. He was always ready to take the mike for hours through the night when everyone else was sleeping, racking up points for the club. At last count, Bill had worked 320 DXCC entities (with 316 confirmed). Frank was a founding member of NADXA and an avid DXer. Miles, W6GYX (l) and Bill, W7YS, at the Coconino County Fair many years ago. "Em" was licensed as W2LLH in 1937 . He joined the NADXA in sepember of 1988, and was a very active member. As a radio engineer, he did extensive work during WW2 in the field of radar with the government. Prior to coming to Flagstaff, he was employed at Space Technology Labs in Los Angeles from 1958. As you can see in the photo, Em had an excellent station and a tri bander on the roof of his home in Cheshire Estates . 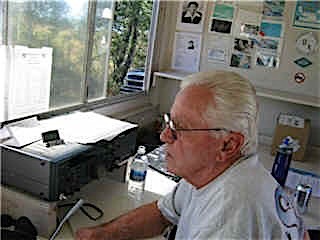 An active DXer and experimenter, he relocated to Oregon and was a member of the local radio club that was involved in activating a radio station aboard a retired submarine. Em became a silent key on 16 july 2005 following a stroke and heart failure. William George Schuchman (1922-2011) passed away on December 23, 2011 at the age of 89. Bill was always into radio…. He repaired radios for the Army in 1942 and worked in the Pentagon doing communications for 30 years. He built communications centers all over the World. He retired from Ft. Huachuca in 1974 and moved to Flagstaff in 1976. 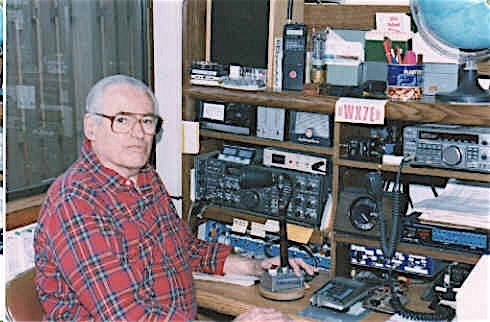 Bill had a passion for amateur radio for over 75 years. He constantly taught others and encouraged new operators. Contesting and chasing DX were his favorite parts of the hobby. Bill was a founding, Charter Member of NADXA and an Elmer to many hams who crossed his path. He was also a Charter Member of the Potomac Valley Radio Club (1947). The call W7YS was assigned to Bill in 1972. It was previously held by Father Sebastian Ruth of St. Martins College in Lacey, WA. (Y calls were originally reserved for schools and experimental stations). 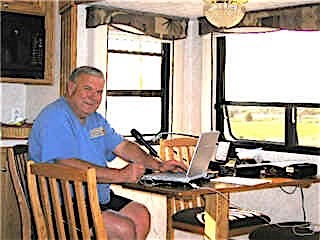 A tribute from Craig Anderson, W9GLT: Bill lived and breathed radio, the frequencies in his brain were all band frequencies, from the bottom of 160 to the top of the top band he had them flowing through his synapses. CW – continuous wave – was his second, actually I think, his first language. His skill at sending and receiving are legendary amongst his friends and cohorts. DX was his passion; meeting, getting to know and being able to talk to one another, on a regular basis, was his goal. Not just a quick 599, exchange of location, name and equipment but; what do you do, what is your area like, do you have family, do you know anyone here or might you know so and so from this or that country? It's not easy to wrap up a life like Bill had and the impact his life had on others, in a couple paragraphs, but those of us that had contact with this man, have been touched by a special person, one unlike many that we will come across in life. John "Jack" Paplow, K7PAP, passed away peacefully on September 3, 2012 in his home in Flagstaff. Jack was originally born in Minnesota and grew up in San Diego. He was married to Tulla for 49 years. He liked to hunt, fish, woodwork, and ham. He served as the Vice President of NADXA, and operated Field Day and Route 66 with the club.